To portray a global view of the tomato puree market, our analysts inspected the global as well as regional markets in detail. One of the most important aspects of this report is, our expert team of analysts have focused on forecast factors and have offered unique perspectives and assumptions on the market scenario. Pricing analysis, value chain analysis and list of active key participants are some of the aspects covered in the newly published report on global tomato puree market. To give the crystal clear picture of the market to our clients, our analysts took extra efforts to give detailed information about market size, forecast, drivers, restraints, trends and opportunities across all seven regions have been covered in this report. Apart from regional insights, we have also given comprehensive information on various segments and its sub-segments. For better understanding of the entire market, we have divided the market based on different parameters. This report includes an overview of the global tomato puree market which covers market size and forecasts, Y-o-Y growth and absolute $ opportunity. The analysts have taken 3600 views of market dynamics and have also taken a glance at various macro-economic factors, supply and demand side drivers, restraints, opportunities and key trends that are affecting the global tomato puree market. Another section of the report consists of market definition and taxonomy. Product-wise Weighted Average Selling Price (ASP) has been considered to deduce market values. Top-down approach has been used to assess market numbers for each product category, while bottom-up approach has been used to counter validate the market estimations. We have taken help from sources such as World Bank and various companies’ annual and financial reports while inspecting this report. Each interview is thoroughly analyzed and every market data point is deduced and validated prior to incorporating in the report. The market value of the global tomato puree market is calculated from the data provided by the average selling price and market volume. For the 8-year forecast of the global tomato puree market, various macroeconomic factors and changing trends have been observed, giving an idea about the future of the market. Other important factors considered in order to arrive at market forecast are the size of the current market, include inputs from the supply side and the demand side and other dynamics shaping the scenario of the market. In the compilation of the report, the forecasts are conducted in terms of value and growth rate, while other important criteria such as year-on-year growth and absolute dollar opportunity have also been incorporated offering the client with crystal clear insights and future opportunities that can be used to formulate different growth or expansion strategies and establish a global footprint. The global tomato puree market has been segmented on the basis of packaging, end use, source, distribution channel and region. Tomato puree is prepared from tomatoes that are grounded, pressed, and blended to a soft creamy paste or thick liquid. Tomato puree is categorized as organic and conventional puree. Organic tomato puree is free from synthetic additives such as pesticides, chemical fertilizers, and dyes. It must not be processed under industrial solvents, irradiation, or genetic engineering. Its content should be 95% organic. Conventional tomato puree products are those that have been processed using any other additives or mixed with any other suitable mixtures to form a product, prepared under good manufacturing practices (GMP guidelines). The market analysis shows that conventional puree is currently more prevalent in the market. 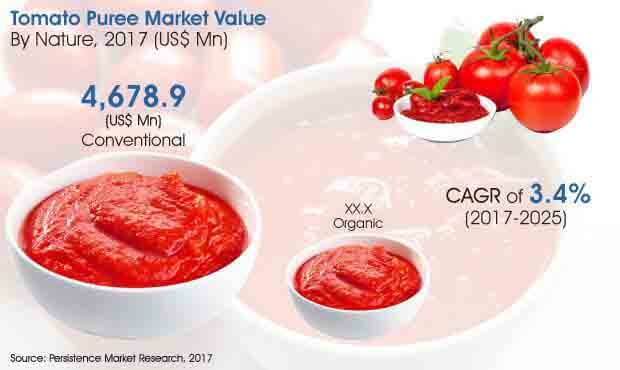 However, organic tomato puree market is expected to gain traction in the coming years. With people growing more and more health conscious with time, it is expected that the demand for organic products would increase. According to the market forecasts, organic tomato puree segment is expected to lead with respect to an exceptional growth rate of 8.4% during the forecast period. Conventional tomato puree still holds a higher market size and is expected to reach a market size of over US$ 5,800 Mn by the end of 2025. Earlier, tomatoes were considered exotic products. But now, their easy availability has fueled the demand for tomatoes and use in various other products. Consumers have become habitual to tomato flavor and taste, and hence, other tomato products have also gained popularity. Apart from grocery retailers, many food chain owners are also infusing tomato puree into their recipes, like salads and beverages, with other traditional vegetable ingredients. Also, considering tomato puree’s wide scope of application in commercial foods and snacks, it is an added factor in fuelling the growth of the tomato puree market. The fondness for tomatoes has also triggered the use of tomato puree in many different products. Many soup manufacturers are blending tomato puree with vegetable soups, due to tomato puree’s natural sweetness and tangy flavor. Carrot soup is very widely consumed in the U.S., and considering the demand for tomato puree only by the carrot juice industry, the demand for tomato puree in the U.S. is likely to increase. In the past few decades, the export of tomatoes has increased considerably. In order to cater to the consumer demand for tomato flavored products, there has been an increased sales for tomato-based ingredients like purees and concentrates. European climatic conditions are not favorable for tomato cultivation. Despite the fact that Spain’s climate is not ideal for growing tomatoes, Spain probably has Europe‘s largest tomato plantations. However, Europe mostly relies on tomatoes imported from Asian countries such as India and China, and Middle Eastern countries such as Turkey. The import rate is higher as compared to the export rate in Europe for tomatoes and its different types of products (purees and concentrates). The rise in import costs may lead to a hesitation growing among manufacturers towards production of tomato puree. The U.S. is largely dependent on the import of tomatoes from markets like Mexico. Despite high demand and popularity of the product, cost issues may hinder the trade and growth of the tomato puree market. The U.S. itself is not a big producer of tomatoes, and hence, the economic scenario may dampen the demand for tomatoes, leading to a decline or a very slow growth in the tomato puree market for an important region like U.S.